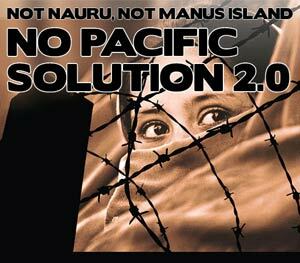 SYDNEY - Australia’s Department of Immigration has confirmed that 170 asylum seekers in Nauru have started a hunger strike. Detainees say that they are protesting their transfer to a remote camp in the South Pacific while they wait to have their refugee claims processed. The protest involves mostly Sri Lankan asylum seekers and others from Afghanistan, Iraq, Iran and Pakistan. They have been taken to Nauru, a tiny South Pacific island near the Equator, to an Australian-sponsored detention center. The detainees are angry at being transported against their will to such a remote location and are worried about what they claim is the slow progress of their asylum applications. Immigration officials say about 170 inmates are refusing to eat, while refugee rights campaigners say the figure is far higher, around 270. Ian Rintoul, from Australia’s Refugee Action Coalition, says one detainee tried to hang himself and was cut free by security guards. "They are desperate. They have seen the deterioration of mental health of others. I mean, two days ago there was the guy who jumped off a light pole in the middle of the detention center with a sheet around his neck," he said. The protestors claim at least three detainees have become unconscious during the hunger strike. Australia recently reopened the camp on Nauru to try to stem a steady flow of asylum seekers arriving by boat. The arrival of thousands of undocumented migrants has become a divisive political issue in Australia. 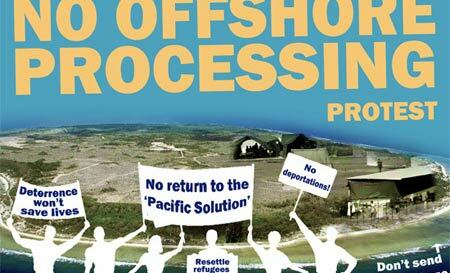 While The Greens party leaders believe all asylum seekers should be assessed on Australian soil, the Labor government and the conservative opposition argue that offshore processing is a powerful deterrent, and will stop asylum seekers making the hazardous sea crossing from Indonesia and beyond. Another remote Australian-sponsored facility in Papua New Guinea is due to open in the next week. Australia resettles about 13,000 refugees each year under a range of international agreements.